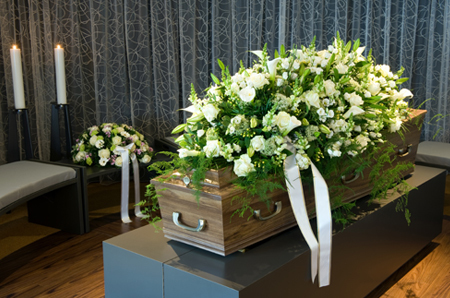 We are pleased to offer a wide selection of coffins in many different styles including bamboo, cardboard, seagrass, coloured or painted, Italian style or American Caskets. Details and costings are available from our office. Below is a small selection of what is available, if you have a specific request / idea, contact us and we will be happy to find out more details on your behalf. Polished oak veneered coffin with brassed handles, nameplate, ornamentation, funeral gown and side sheets.